Former Wales manager Mark Hughes praised the progress the team has made under current boss Chris Coleman. 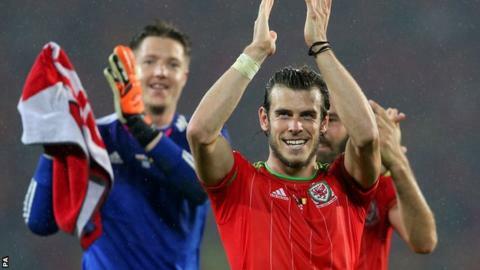 Wales top their Euro 2016 qualifying group after beating Belgium 1-0. That also saw them enter the top 10 of Fifa's world rankings for the first time and become one of the top seeds for Saturday's 2018 World Cup draw. "Chris and the guys have... pushed Welsh football forward. That's enabled us to be one of the top seeds so that's a huge thing," Hughes said. "Throughout my career as both a player and a manager it was always the case, when the draw came around you were up against three or four outstanding teams that you had to overcome. "If you're a top seed then maybe the challenge isn't as great... it's a huge advantage and credit to everybody concerned with Welsh football. "They've been on this run, they've played key games and overcome top opposition, and that's why they are where they are." Wales were ranked as low as 117th as recently as August 2011, but under Coleman have made a remarkable rise up the rankings after a difficult start under the former Fulham boss. Coleman took over the Wales reins in 2012 following the death of Gary Speed and lost his first four matches in charge, but he has overseen a significant improvement since. With a three-point lead at the top of Euro 2016 qualifying Group B and four games remaining, Wales are looking good to reach their first major finals since the 1958 World Cup in Sweden. "Everybody is absolutely delighted where Chris has got the guys and we wish them well," added Hughes, who as both a player and a manager agonisingly just missed out on qualifying for one of the big tournaments. "Hopefully we can get to the European Championships and following that a World Cup for the first time in 50, 60 years. "It's going to be a huge achievement to be able to do it and it looks like it's more than a possibility now."